Gonna take a pass on the smudgey backgrounds for now. Might change my mind later, not sure yet. -EDIT- Woke up and changed my mind. Less smudgey more… I dunno, marble-y? I love peaches, but then again I'm an omnivore. They’re good out of a can, but I can’t do fresh one. Can’t handle the fuzz. Try nectarines, they’re a mutant non-fuzz version of peaches. I’m the exact opposite. Love fresh ripe peaches. Best when right off the tree. Can’t stand canned ones. I used to imagine them as juicy rodents; I love gryphons and cats, it’s a fantasy fulfillment thing. Well after that analogy, i don’t think i’m ever going to be able to eat a soft peach again…. On the other hand, I’m going to be hard pressed not to want to attach some sort of tail to the next peach I eat. I had a feeling that Agent Brown is a lot more caring than he first seemed. One can be caring and still be a jerk. Or forced to act like a jerk because if he breaks the rules he’ll just be replaced by someone who can follow the rules, and those who made the rules are overprotective. My theory is not going to jive with your theory, then. One can follow rules without being a jerk, and even stress the importance of keeping rules to others without being a jerk. Jerkiness is mostly a matter of not thinking about how other people are going to think/feel before you say and do things. As someone who grew up in north Georgia, I’m obliged to enjoy peaches. Remember the peaches not the man who freed you from them. That makes sense though. A little kid would remember A Traumatizing Event (like being a carnivore forced to eat peaches) but not necessarily remember the people present at the time. Ok, so Brown may get a pass on this one. Still, if he pulls this and still tries to withhold information from Todd & his parents about Nei Li, I will default to my original position on him. Although, Dr. Bunnyme looks like he’s about ready to spill the goods, so Todd & his family may have an alternate information source once this is over. Could be a simple matter of getting a phone number. All he has to know is Todd’s name, I would assume. They got Google in this universe, remember? FINE, Agent Brown, you’re not as big a jerk. Also, Panels 5 & 12 are … well … Agent Brown actually has emotions. Who knew? And Pohl … I can only imagine his “Oh … omigod (or gods, I don’t know), she knows nothing!” Keep up the good work. JUST TELL THE POOR GIRL! FOR THE LOVE OF FISH! Dr. Bunnymes it’s up to you! I liked the smudgey backgrounds. Thought they gave the strip a nice feel. Told you he meant it as a noce gesture and not a spiteful revenge attempt. Also told you Selkie was shocked and not angry. I told you. It’s interesting how this is working. This is probably the first strip that moves Mr. Brown from generic MIB to a human face of a government policy which, good or bad, is probably is not doing good things for his sense of humor. To a certain extent this is reminding me of Skin Horse with Brown as much a social worker as shadow agent (probably with about the same budget.) and the morality of his position aside it must be a bit frustrating how much he is able to do his job. After all the “City in Lake Erie” may be an “official secret”(leaks aside) but Selkie and Dr. Pohl are clearly not being hidden. Oh. My. Goodness… Agent Brown is Selkie’s real father isn’t he? Um. Unless he’s had some SERIOUS cosmetic surgery… I’m thinking probably not. But, he may be the person whose house we see during the flashback where Selkie/Nei Li remembers coming out of the water with her Mom. Actually, disregard that last bit. It can’t be his house, or he’d have known exactly when she went to the orphanage instead of finding out after she’d already been there a week. Well, think about it. Are you familiar with the legend of selkies? They are usually human men with selkie women. The selkie women usually return to the sea at some point to their selkie husbands and then there are hybrid selkie children. This comic is all about interracial, mixed families, and it would not surprise me one bit if we ended up discovering that Agent Brown is Selkie’s mother’s human husband and she left Selkie there when she went back to the sea for whatever reason and Agent Brown, being constantly working and uptight, didn’t know for a while… Just sayin’ it’s a possibility. I have thrown up a integration theory before. 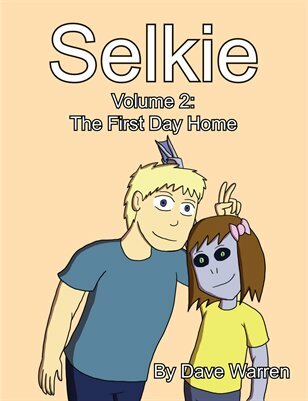 Selkie may have been left because of political reasons. Could be there is less communication between our gov and theirs. More back story would be nice but many people don’t like how it slows down the story. I predict Professor Trunchbull will be the one who gives Todd information pn Selkie. Ugh. You may be right, but I really hope not. That supercilious jerk. I keep hoping Selkie’s illness becomes a serious knockback for them. And their little dog, Truck, too.